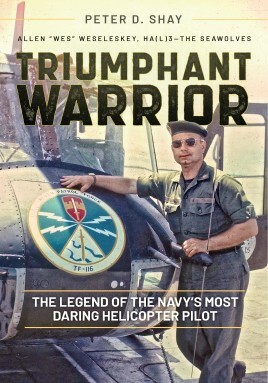 The pilot, Lieutenant Commander Allen E. “Wes” Weseleskey, had been assigned to the Navy’s Helicopter Attack (Light) Squadron Three, the “Seawolves” at the Vinh Long Army Airfield. His controversial mission took place on March 9, 1968 on the outskirts of Sadec, in the Mekong Delta region of Vietnam. Two ARVN companies were being overwhelmed and despite coming under heavy fire, Weseleskey decided to go in and rescue as many survivors as possible. The accompanying Seawolf is forced to turn back after taking hits, but Weseleskey with the agreement of his crew persisted in the attempt, flying so low under the treeline that the VC rocket launchers were unable to reach it. On reaching base, it was observed that the overladen helicopter "looked like it had been used as a battering ram."